file, w/fixed DOBs and Years Pro. 2. 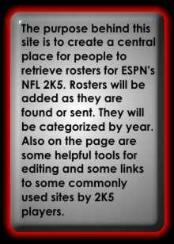 Uploaded a 2k12 roster file. is the first version, but is pretty accurate. 1. Created a page for the 1996 roster. we have one from Tecmo2012. 2. Updated dophin26's 1983 file. the 1988 roster and franchise. additions. It is the blue link. convince's roster to the latest versions.